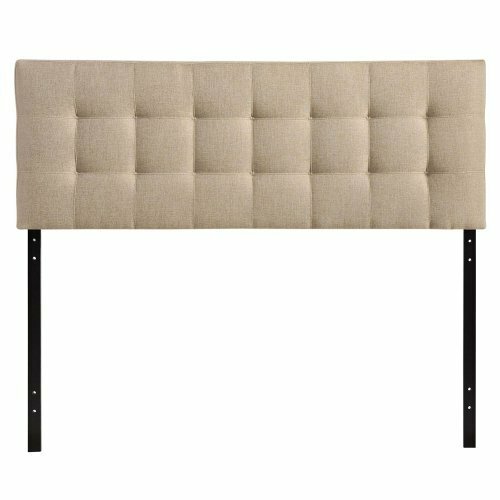 i Click 'view all' to instantly compare this good deal with offers on other top headboards. Modway Lily Upholstered Tufted Fabric Headboard King Size In Navy is currently selling at $130.21, approximately $2.03 lower than average, giving a potential saving of $12.42 right now. With a lowest price of $128.46 and an average of $132.24 it is selling on the low end of its usual range. Price volatility is 93.46% (meaning it changes all the time), so the price will almost certainly go up soon. Right now this product is a recommended 'good deal'. The price has also dropped by $2.61 (1.97%) in the last hour. 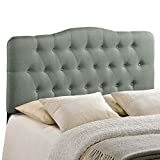 Compare the current price, savings (in dollars & percent) and Buy Ratings for the top Headboards that are closely related to Modway Lily Upholstered Tufted Fabric Headboard King Size In Navy. Here is how Modway Lily Upholstered Tufted Fabric Headboard King Size In Navy compares with other leading Headboards. Add elegance to your bedroom with the Lily tufted headboard. Designed with just the right amount of grace, Lily is made from fiberboard, plywood, and fine polyester upholstering for a construction that is both lightweight and long-lasting. Perfect for contemporary and modern bedrooms, sleep soundly with a piece that imparts a sense of tranquility amidst an impressive backdrop of style. 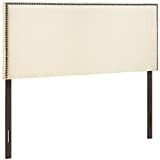 FeaturesSTATEMENT PIECE - Instantly updating the look in any bedroom, this headboard makes a sophisticated statement in any space it sits thanks to the stylish characteristics and elegant design.QUALITY UPHOLSTERY - Boasting a hue that adds a tranquil and relaxing feel to a room, Lily comes upholstered with high quality polyester fabric that's soft to the touch.STUNNING DETAIL - Showcasing a structured pattern, the tufted checkered design allows for a chic look. The stunning yet subtle details of this headboard make it a piece that never goes out of style.TUFTED DESIGN- Classically elegant, the headboard boasts a timeless tufted design that adds alluring luxury to any bedroom, and creates the perfect backdrop for all kinds of bedding and sham types.